I am currently driving a red-hot Audi A5 Coupe and I must say the last 4 days hold awesome memories of cruising down Sheikh Zayed Road listening to music on one of the coolest sound systems I have come across from Audi. I received the A5 because the R8 is only coming to me in a few weeks time post Eid Holidays so in the interim I am getting a low down on Audi and its numerous models. While in waiting for the R8, in true diva style I am busy checking out the latest on the car and it seems that Hugh Jackman and the stars of The Wolverine, distributed by 20th Century Fox, were joined by a very special guest – the Audi R8 – at the premiere of the film in London’s Leicester Square. 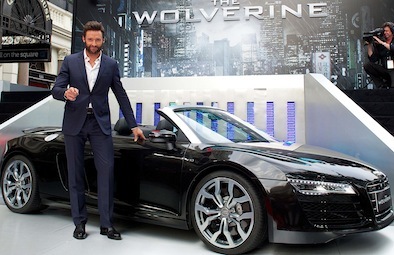 The smart occasion was attended by numerous big names including Will Yun Lee, Rila Fukushima, Tao Okamoto, Famke Janssen and director James Mangold – all of whom were chauffeured to the top of the red carpet by a fleet of Audi A8s. The Movie, due for UK general release on July 25th, is based on the celebrated comic book arc. Lucky for me I will be in London when it gets released … smiling heaps about that. Back to the movie – This epic action adventure takes Wolverine, the most iconic if character of the X-Men universe to modern-day Japan. Out of his depth in an unknown world he will face a host of unexpected and deadly opponents in a life-or death battle that will leave him forever changed. Vulnerable for the first time and pushed to his physical and emotional limits, he confronts not only lethal samurai steel but also his inner struggle against his own immortality. I guess I must start getting my wardrobe ready with diva like looks for a fling with the R8. Lets hope London and Spain provide some inspiration.